These curtains were about 16 inches too long. out of the drapery business. I didn’t want to cut and hem them in case I want to use them somewhere else (I like to mix things up)…and I am lazy. Hellooooo Stitch Witchery. I love this stuff. Presto! I might iron on trim along the border. (The iron curtain rod is on sale at Pottery Barn). Aren’t these roses from the grocery store pretty? Still going strong after five days. The mirror, by Ralph Lauren, is about 15 years old. It’s versatile as it used to be in our bedroom. Since we have lots of Meyer lemons (a thin skinned, juicy lemon) on our tree,I dreamed up this simple, tasty recipe and pretended I was on a cooking show. Grill the chicken breasts while the pasta is cooking. When the pasta is cooked, drained and squeeze the juice of one half of one lemon on it (it soaks it up). Put pasta in bowl, add chopped chicken, pour garlic oil from pan over it and 1/3 cup grated parmesan, zest from one lemon and some chopped basil. Toss together. Serves four people (or two teen aged boys). This is from my friend, Nancy’s blog, A Communal Table. umbrella stand on wheels from Pier One Imports. 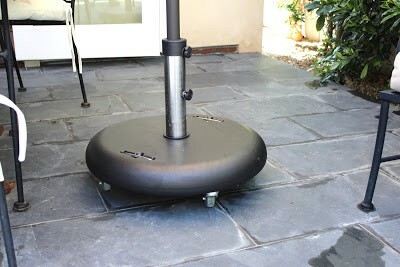 It makes is so easy to move your umbrella with the sun and it has locking brakes. 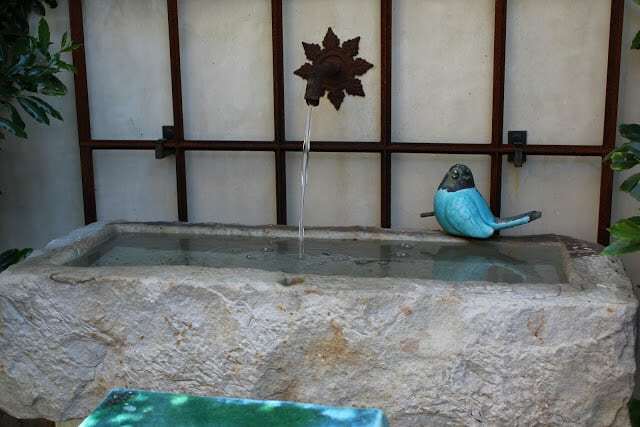 This fountain was broken but I fixed it myself. HIGH Five! (It was just all plugged up). there are shells in our sandy dirt anyway. Décor Projects IN THE WORKS! 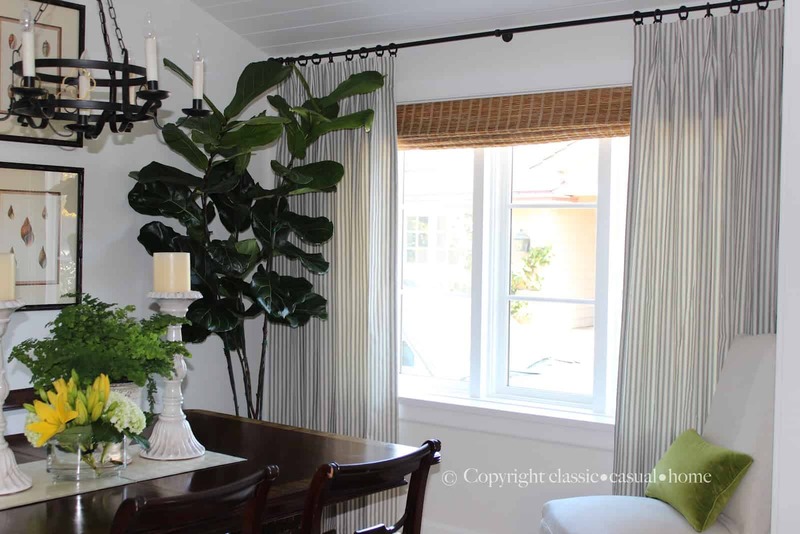 Love the drapes, that is wonderful that you got a great deal on them…..The umbrella stand on wheels is so cool, I am in the midst of looking for one for my patio set. Thanks for the information. Pasta and brownies sound awesome, did you save me some? HA! I love posts like this! It's the little details in life that make it so interesting. I have to try your recipe! And the drapes look lovely…I really like that iron on webbing. Enjoy your weekend! I've been by stalking your blog before, but never stopped to say hello–excuse my manners! I love ticking stripes and your new drapes are just my style, hmmmmm, maybe I should think about that! Great job and I love the moveable umbrella stand too! 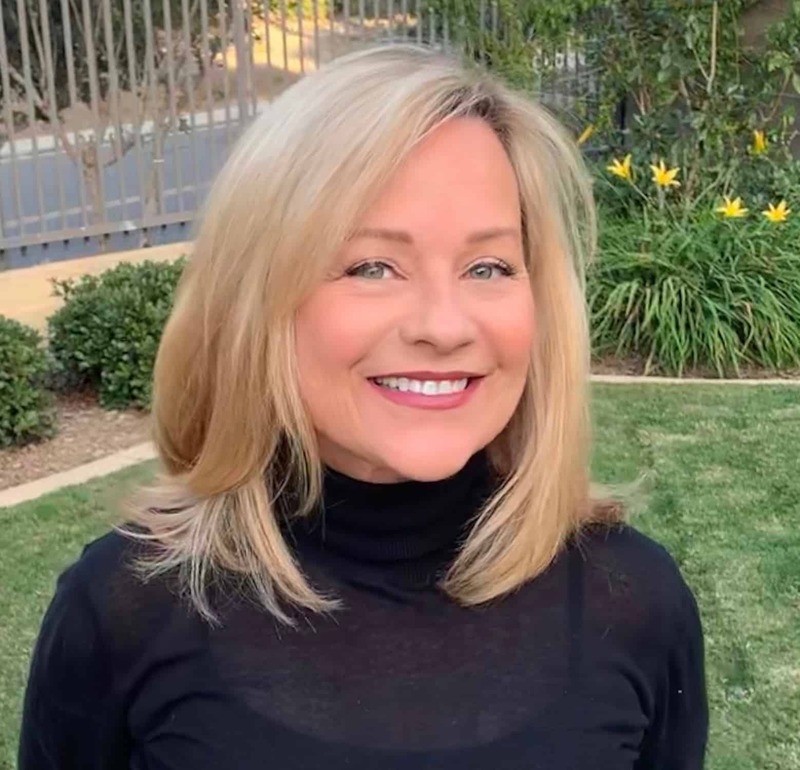 Love this post – covered it all! Have to try that chicken recipe – making my mouth water. I LOVE stitch witchery!! Couldn't have lived without it with my children's costumes, etc. I love the curtains, and I think you didi the right thing by leaving them longer. I am trying this chicken disk. Looks amazing. I am getting the umbrella stand. So much easier. You have been one busy lady, Mary Ann! The curtains look great. I have that curtain rod in two rooms of my house and love it. Would you ever share where you got your roman shades from? Paige: The grass shade is from The Shade Store. The windows there and in the living room are deeply inset, so that is why I put them inside the frame and not above. I appreciate you getting back to me! I have one more question and I have my fingers crossed you will share. Do you know which color you have in your home? I ordered their samples and the "Montauk Woven Wood Shades" appeared online to be the most similar to yours. I just can't decide on which color/stitching color to get! Thank you. I grew up on Lido and am now in LA. Lido is such an amazing place! Wow a lot packed into one post! 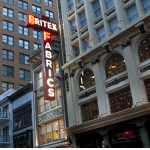 Good to know about the stitch witchery…..the drapes look great and that pasta, OMG I MUST try it! Looks sooo good. Thanks for sharing, this is a must make!! Have a great weekend. Yum! Great blog post but the pasta really caught my eye! 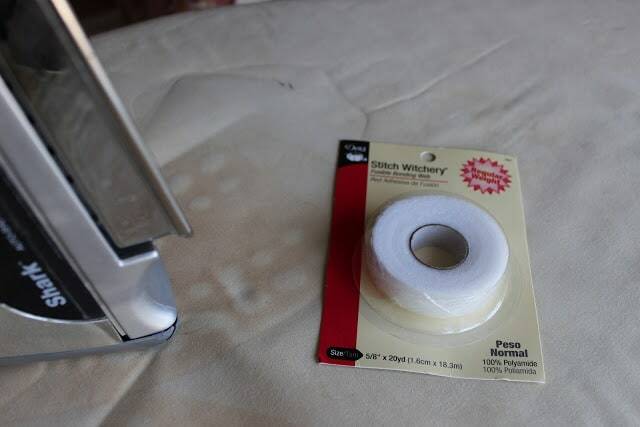 I also get lazy with projects so thanks for sharing about the hem tape! Great curtains, beautiful roses, Ralph Lauren mirror, and delicious food. Wow! Love the random things in your house…and Stitch Witchery is a big hit at my house, too. I always put a monster hem on my curtains just in case they end up getting moved around. Great tip with the stitch witchery! Also, I need you to come over and make that meal for me tomorrow night, and make my patio look like yours. Absolutely gorgeous! 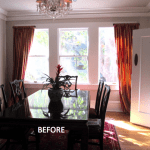 Love your new curtains and all your fresh updates! I always leave your blog inspired!! I love Stitch Witchery, so much easier than tear out all my mistakes! Looks like Chez Pickett is in full summer mode with that patio, complete with fully functioning fountain. I'm picturing cocktails in the evening? 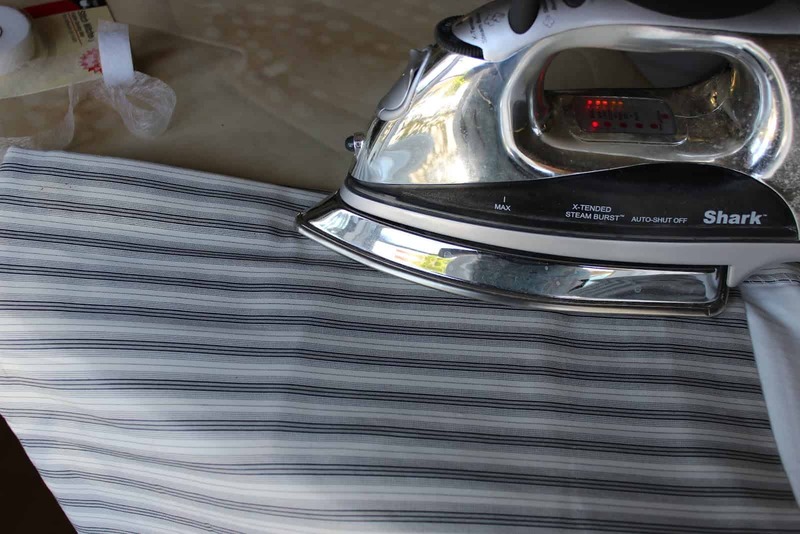 I'm a hue fan of iron on hemming tape too – it's magical! And it holds well over time (but I threw a table runner hemmed with it in the wash and – it doesn't like the washing machine. Oops.) Your home looks so pretty and all ready for summer! Love the stitch witchery idea. 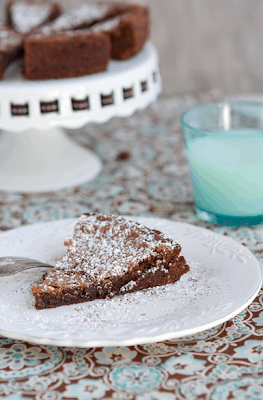 Must try the chicken and 4-minute brownie recipes. It is always fun seeing the updates in your home. Mary Ann I love your new panels and I use stitch witchery all of the time! You go girl!! The fountain! The new panels look great and so does your dinner. Love the drapes. The roses are really pretty and I'm a huge fan of roses that last beyond one day after being cut and brought in. I'll check out the selection at our market. The umbrella stand is inspired! I will definitely file this one for future acquisition. 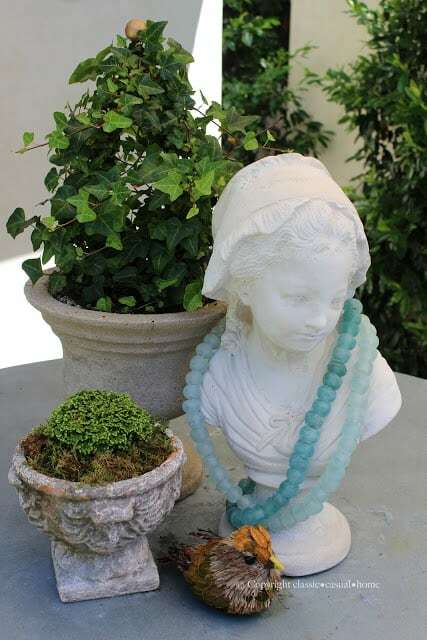 🙂 I also like the little vignette with the bird, bust and plant. 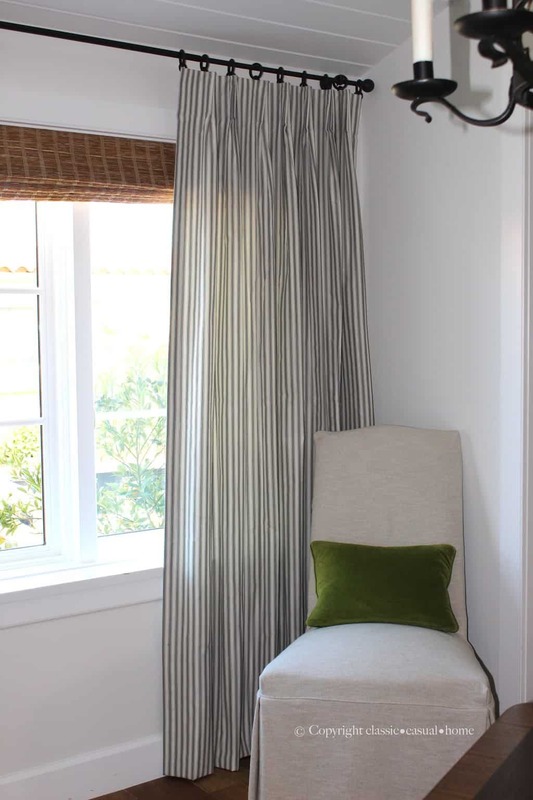 The drapes are wonderful and add the perfect finishing touch to your window! And love the "easy" hem job! They look great. Have to try making your pasta and the 4 minute brownie cake looks delish! As always, a very inspiring post! Thx Mary Ann for the sweet blog comments! I LOVE LOVE ticking stripe anywhere…and actually I"m about to have ticking stripes mixed with the same rose colors in our future guestroom at the farm! 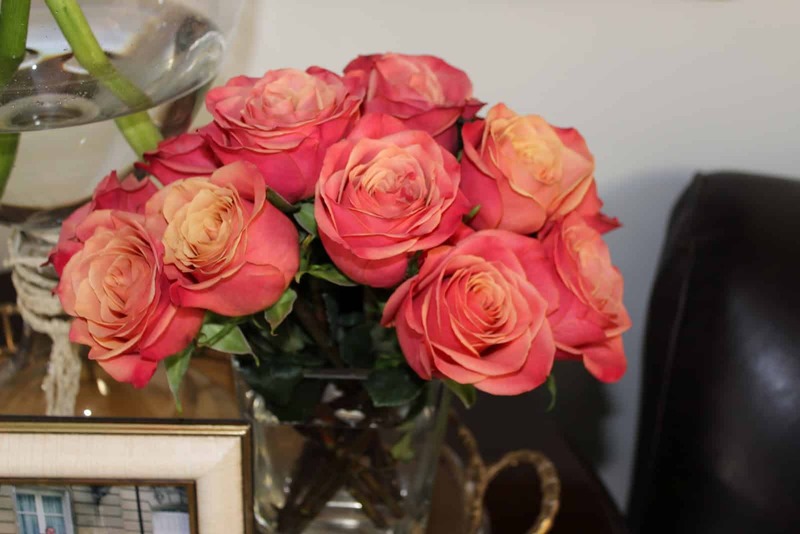 Those roses are BEAUTIFUL…. and yes, that dinner looks so yummy!! So many pretty things to look at and that pasta looks delicious! 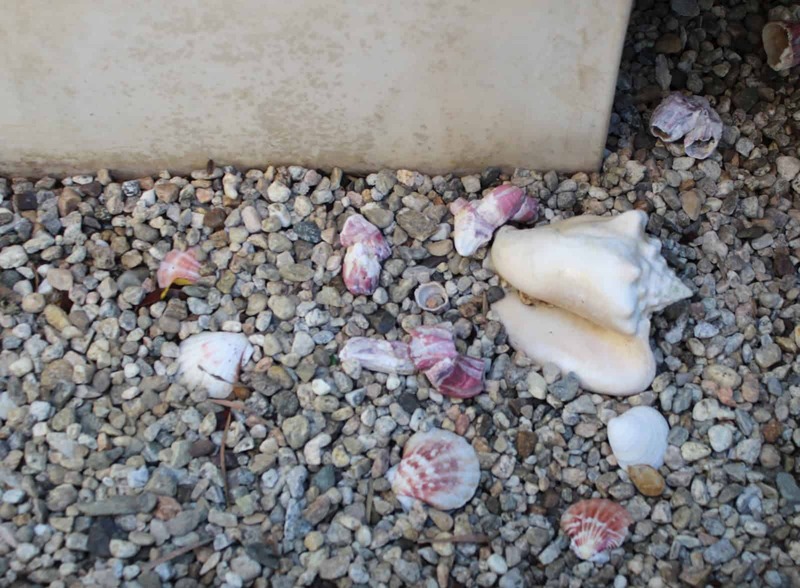 Your alfresco dinning looks perfect and I love the fountain with the shells scattered about. Your drapes look so pretty and very clever of you to tape up excess fabric rather than trimming it! Stitch witchery is a wonder product! I'm right in the middle of an Annie Sloan paint makeover with a sideboard!! Hope to post on Monday..
LOVE those drapes and your use of stitch witchery is genius. Roses are beautiful…love that color….and….I WANT THAT UMBRELLA…awesome. I love your random updates, and your outdoor space is just gorgeous! Way to go on the fountain fix! I love it when I can get something fixed myself! The curtains looks wonderful and SO does that pasta! Yum!! Gorgeous inspiration! Mostly gardening moving plantings, rooting others, raking and making sure the birdbath stays filled as well as the humming bird feeder. Sad to hear your friend is leaving the drapery business, my fabricator has closed her doors as well. We do what we must I have lots of sewing/fabrication experience, so like you, I make all the changes and just do it. Love the gray stripes on the drapery I have demin stripe drapery in my famiy room and love the look. I'd like to remake them in a Sunbrella fabric (demin ticking) so they won't fade ~ but they haven't come out with that yet…still looking. Recipe sounds yummy I'll have to try it. Love the stitch witchery suggestion! I can't sew and I am lazy so I think that is something I might actually do! That pasta sounds fabulous. I love anything with lot's of lemon and lemon zest. My zester is my best friend! 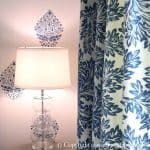 I love your blog and would really like to know where the fabric for your curtain panels comes from. I have a friend who wants me to make black and white ticking panels for her but I'm having trouble finding the right fabric. Thanks so much for a terrific post. I love those striped drapes! They are beautiful! Your home is so lovely! The drapes are beautiful! Love your patio…so inviting! And the brownie pie looks so yummy I had to pin it! Oh there is always lots of randomness going on here…let's see i have to get drapery hardware so I'm going to check out the PB rods now. 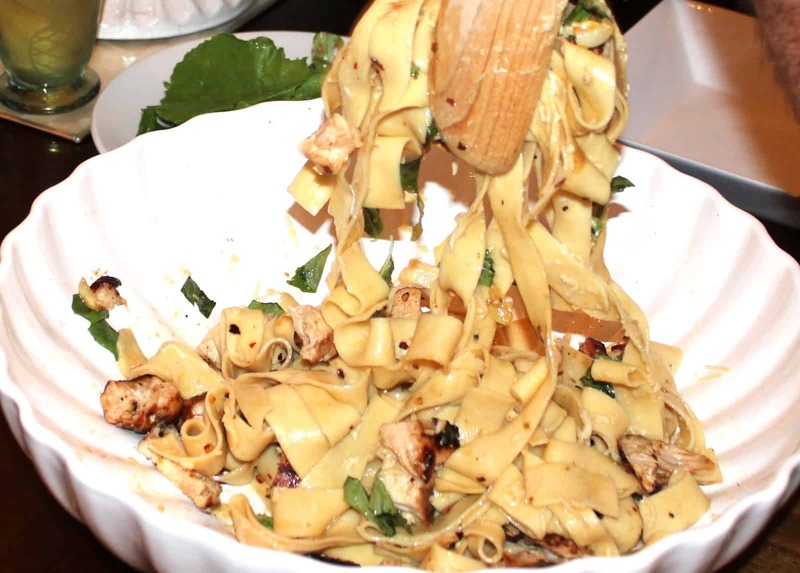 Your pasta dish looks heavenly too. Guess the credits for this apartment design and infrastructure goes to the architect or the estate owner for making it so lavishing.. I think a remodel is in store at my house. I'm needing more than a little random fluff! Some nice touches here, MaryAnn. Loved your random update! Your patio looks beautiful and thanks for the umbrella stand tip! If you did have a cooking show I'd watch for sure, your creation looks delish! I love the drapery fix! 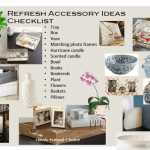 I am always up for quick and easy ways to spruce up the home! 🙂 And I love your backyard seating area. So peaceful and tranquil! I love iron tape too 🙂 That recipe looks amazing, can't wait to try. Really awesome design..The curtains too look so beautiful..I would love to give a try at my home..
Stitch Witchery! That's my idea of sewing…why haven't I ever tried this? Everything looks great including your lemon chicken pasta and 4 minute brownie pie! Looking forward to Friday! BTW – I am really enjoying your blog and added you to my blogroll. Thank you for the inspiration! Fun post. 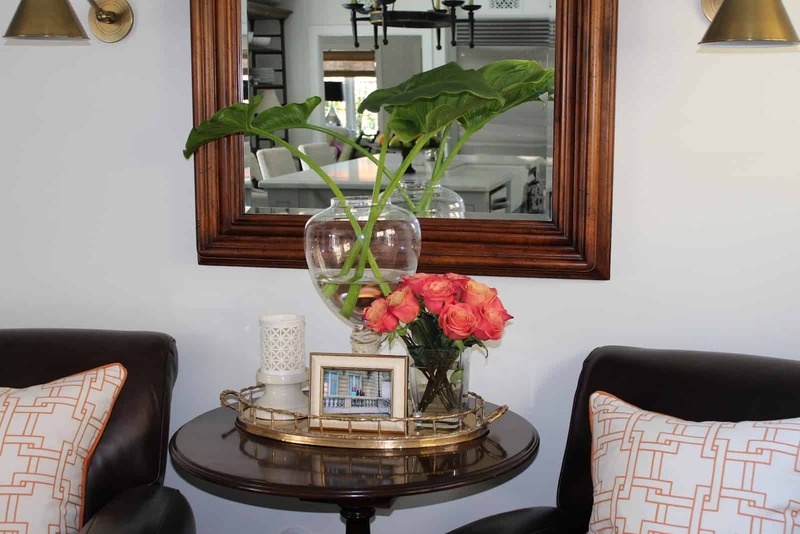 That inspires me to go around my house this week and style mini vignettes to post…thanks for the inspiration! aweesome! I had never heard of that hem thingie…good to know! That umbrella stand is brilliant! I love that it has wheels. The recipe looks amazing, too! Your drapes look wonderful! Very nice umbrella too. Thank you for joining me at Home Sweet Home! Your porch is so pretty! I'm not sure I've seen it before!!! i just love everything about your house!!!!!!!!!!!!!!! Any pasta with lemon is irresistable and your version sounds amazing! We have family visiting from Germany – I think I'm going to make that for them tomorrow night! Your new curtains look great too! I LOVE your fountain!!! I can't sew at all, so I've used SW before and it does the trick. I am obsessing over lemons this year so I am going to have to try your receipe-looks so good.